Having just seen the Patriarch of the West (OK, the title's currently in abeyance, but still...), a spiritual father of the East is about to roll onto these shores. Next week, the Maronite Patriarch Cardinal Nasrallah Pierre Sfeir begins a weeklong Stateside swing in New York, with subsequent stops in Philadelphia, Houston, and Washington; along the way, the 88 year-old head of the 9 million-member global fold will meet with both UN Secretary-General Ban Ki-moon and (for the second time) President Bush. 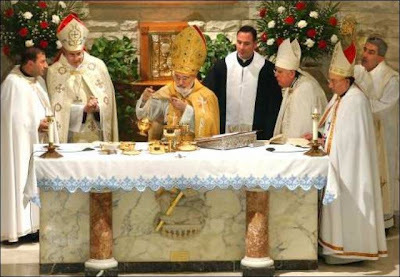 Among other highlights, Sfeir -- officially "the 76th patriarch of Antioch and and the Whole Levant" -- will celebrate a Pontifical Maronite Liturgy in the River City's Latin-rite Cathedral-Basilica and receive an honorary doctorate from Villanova University, join a roundtable discussion on the Maronite church in Houston, meet with youth and young adults of the church and offer the Eucharist for the communities in each of the cities on his schedule. The US trip is but one part of the patriarch's monthlong foreign tour, which began earlier this week at Qatar's first church before taking him to South Africa. After the States, Sfeir touches down in Spain, where he'll meet with King Juan Carlos on the way back to his base in Beirut. Home to 3 million Maronite Catholics, the US has two eparchies for the community: the longstanding outpost of St Maron in Brooklyn, founded in 1966 and, since 2000, a western hub based in Los Angeles. Between the two, American Maronites can count close to 70 parishes and missions, two monasteries, two convents, a seminary in the capital, and the National Shrine of Our Lady of Lebanon, located in North Jackson, Ohio. A key intermediary and force for reconciliation amid the recent gridlock in Lebanon that's still failed to produce a successor to President Emile Lahoud, the former head of state called Sfeir "the patriarch of all Lebanon, not only of the Maronites," comparing the patriarch's role to that of the president as a figure of national unity. Speaking of father-figures, the de facto patriarch of American Catholicism's conservative wing has gotten an even fuller plate, courtesy of B16. Already a member of the Apostolic Signatura -- the church's top court where, as a priest, he became the first US native to serve in one of its top posts -- Archbishop Raymond Burke of St Louis was named on Tuesday to the Pontifical Council for the Interpretation of Legislative Texts and, even more significantly, the Congregation for the Clergy. With the Signatura's top post seemingly about to open given the long-rumored appointment of its prefect, Cardinal Agostino Vallini, as the Pope's Vicar for Rome, some have been led to wonder whether yet another shoe is still to drop.... Regardless, as of this writing, the celebrated canonist best-known for his brushes with controversy has more Curial appointments to his name than last November's class of new cardinals, who are still basking in the longest "honeymoon" (i.e. red hat minus Roman responsibilities) in memory. While Tuesday's nods saw the shepherd of the onetime "Rome of the West" joined at Legislative Texts by Archbishop John Myers of Newark -- whose sci-fi homage Space Vulture hit the shelves in recent weeks -- it'd take a good bit of effort for either to equal the most intense Curial commitment shown by a resident US prelate: namely, Burke's predecessor in St Louis, now Philadelphia's Cardinal Justin Rigali. Named to the all-powerful Congregation for Bishops -- where he previously served as its second-in-command -- last fall, Pharaoh's made an assiduous homecoming to the table of the Vatican's "workhorse" dicastery... literally -- while prior American cardinal-archbishops assigned to Bishops would normally phone in their terna votes, Rigali's religiously been on-site for the congregation's fortnightly meetings, the latest of which took place earlier today. In other things Burke, the archbishop recently zapped the local faculties of Fr Tom Doyle, the longtime advocate for abuse survivors, after Doyle acted as canonical counsel for two members of the (schismatic + excommunicated) board of renegade St Stanislaus parish. Keeping with the theme of crowded calendars, just on this side of the Pond, the traveling circuit is about to experience the kind of overload it hasn't seen in years: five ordinations, two installations... and a Ted with a Golden Jubilee. In other words, just in time for summer, party time is back, and in a big way. Starting in earnest on 19 May in Shreveport for the ordination and installation of Bishop-elect Mike Duca, the wave then moves to San Fran for auxiliary-elect Bill Justice's ordination on the 28th, Des Moines for Bishop Richard Pates' installation on the 29th, Bishop-elect Jim Conley's big day the next day in Denver, new auxiliary Oscar Cantu's 2 June rites in San Antonio, Little Rock's welcome for Bishop-elect Tony Taylor three days later, and finally (at least, for now) to Mobile, where Archbishop-elect Thomas Rodi will be installed on the 6th. In the midst of it all, arguably the marquee event will come in the capital on Visitation Night, as an international phalanx of well-wishers descends to honor DC's Cardinal Theodore McCarrick on the 50th anniversary of his priestly ordination. To mark the milestone, Uncle Ted -- who's stepped up his international humanitarian work since "retiring" two years ago this week -- will celebrate a public Mass in the Basilica of the National Shrine of the Immaculate Conception, followed by an open reception. Looking forward, with at least a couple more appointments visible in the distance before the wheels wind down for Roman Summer, the chaos shows little sign of easing up; of course, the celebrations head across the Pond at June's end for the "end of school" that'll see at least three newly-named American archbishops -- Rodi, Baltimore's Edwin O'Brien and the Twin Cities' John Nienstedt -- receive the chief symbol of their office, the pallium. With a late entry or two likely in tow from these shores, the traditional 29 June conferral of the lambswool band on the new metropolitans appointed within the last year will be prefaced by B16's opening of the worldwide Pauline Year the evening before in the Basilica of St Paul's Outside the Walls. Yet while it's celebratory all around from late month on, the current reunion cycle starts on a low note on Monday as Bishop Donald Montrose of Stockton is laid to rest. Head of the NorCal church from 1986 until his retirement in 1999, the native Angeleno died early yesterday -- the 59th anniversary of his priestly ordination -- aged 84. ...and for all the rest, as always, stay tuned. "Book of Life" Goes Live?